Background: Ultrasonic assisted liposuction (UAL) is used for cosmetic surgery. This technology may be also applied for debulking intra-abdominal fat. Potential applications are omental fat reduction for treatment of metabolic syndrome, facilitating surgical lymphadenectomy and improving the operative field in areas such as pelvis and retroperitoneum. 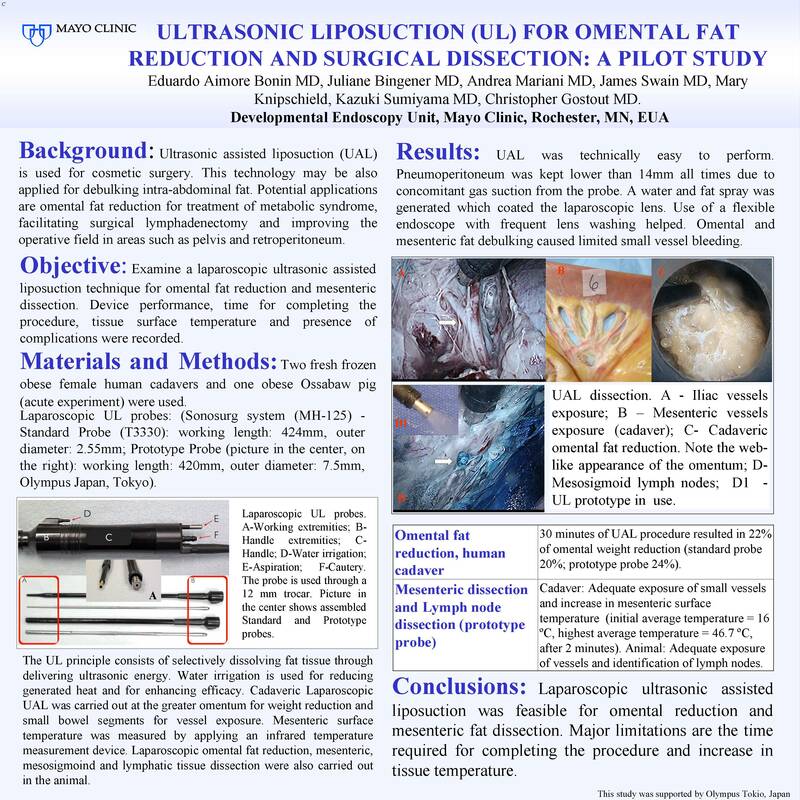 Objective: The aim of the study was to examine a laparoscopic ultrasonic assisted liposuction technique for omental fat reduction and mesenteric dissection in human obese cadavers and living obese swine. Device performance, time for completing the procedure, tissue surface temperature and presence of complications were recorded. Patients and methods: With IRB exemption and IACUC approval, two fresh frozen obese female human cadavers and one obese Ossabaw pig (acute experiment) were used. Two different sized and configuration ultrasound probes were used (Sonosurg system (MH-125) – Standard Probe (T3330): working length: 424mm, outer diameter: 2.55mm; Prototype Probe: Working length: 420mm, outer diameter: 7.5mm, Olympus Japan, Tokyo). The laparoscopic procedures were performed in a supine position. After placement of a supraumbilical 12mm trocar, CO2 pneumoperitoneum was maintained at 14 mmHG. Two other trocars were positioned at the lower abdomen, one at the left flank (5mm) for placing a laparoscopic grasper and other suprapubic (12mm) for placing the ultrasonic device. Cadaveric Laparoscopic UAL: The greater omentum was harvested using an open incision and divided in half. Each half had its weight measured. After omental reinsertion and abdominal closure, the laparoscopic liposuction procedure was carried out for 30 minutes on each half. After finishing the procedure, both pieces of omentum were taken out for weight measurement and for gross inspection. Cadaveric mesenteric dissection: An open UAL procedure was carried out using small bowel segments. Mesenteric surface temperature was measured on three occasions (pre-procedure, 2 minutes during procedure and post-procedure) by applying an infrared temperature measurement device 1cm from the mesenteric surface. The procedure was considered finished when adequate exposure of blood and lymphatic vessels was achieved. Laparoscopic omental fat reduction and mesenteric dissection were also carried out in a living obese Ossabaw pig. Results: UAL was technically easy to perform. Pneumoperitoneum was kept lower than 14mm all times due to concomitant suction from the probe. A water and fat spray was generated which coated the laparoscopic lens, especially in the living animal. In the live animal, use of a flexible endoscope with frequent lens washing helped. In the human cadaver, a 30 minute period of omental fat debulking resulted in 22% of omental weight reduction (standard probe 20%; prototype probe 24%). For mesenteric dissection, an increase of mesenteric surface temperature was observed (initial average temperature = 16 ºC, highest average temperature = 46.7 ºC, 2 minutes after procedure) . Lymph nodes were exposed during the animal procedure and could be readily identified. Omental and mesenteric fat debulking caused limited small vessel bleeding. Conclusions: Laparoscopic ultrasonic assisted liposuction was feasible for omental reduction and mesenteric fat dissection. Major limitations are the time required for completing the procedure and increase in tissue temperature.